Chocolate: It's Why We Run: I hope your run went better than mine!!!! A community of runners (or others) logging in their progress for encouragement and motivation. I'm Back in the Game, Baby!! I hope your run went better than mine!!!! Today was a good day for a long run. It was in the 70s, cloudy, almost drizzling. I was wearing some new running shorts and new running shoes. I had a babysitter, and time to run. 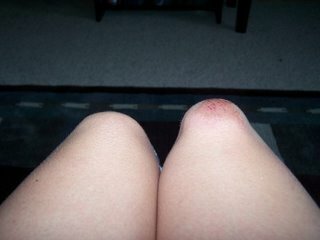 However, not 1/2 mile from my house, I stumbled and fell...hard...right on my knees. Blood was dripping down, and my knees were hurting, so I decided to turn back, get cleaned off and just do a few miles on the treadmill. After only 1.5 miles on the treadmill I had to stop because the sweat oozing into my scraped knees caused too much stinging. When I sat down on the weight machine next to our treadmill, feeling defeated, I was immediately taken aback by how my right new actually appeared. It looked like someone stuffed a golf ball inside it. It was so scary looking. 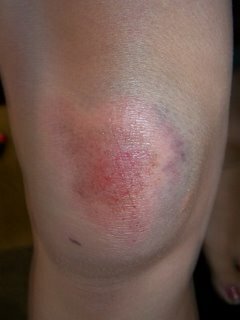 Later, the swelling went down some, but then my skin turned black and blue. And the scrapes are still burning! I better go get some ice, take some advil and try again next week. Can you spare the pictures so we can just use our imagination?? Oh, MAN!!! I'll be praying for a quick recovery.....OOOOWWWWWWW!!!!! OK...so while I read this blog, I have nothing to contribute in the fitness category. But seeing those photos of your knee!!!! OWWIE!! That's gotta smart!! Sending prayers for a speedy recovery and as little pain and stiffness as possible to go along with it.